This story is about a trip I took with dad in Vietnam while on vacation at spring break for my birthday. We were on a trip with some really nice people and a chef, Neal, who was on the Iron Chef TV show. 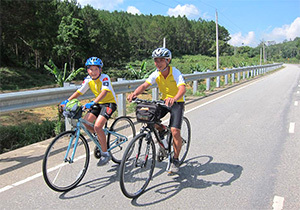 The trip was about discovering the food in Vietnam but we were also biking for a lot of the trip. Everyone was really nice on the trip and I made a lot of friends in Vietnam and learned a lot about the country that I did not know at all. 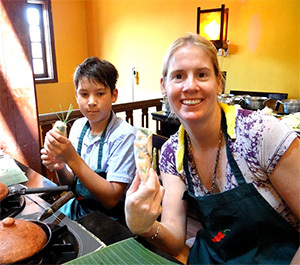 I learned some language and even learned how to cook Vietnamese food -- it is my favorite! Hanoi is a really busy city. 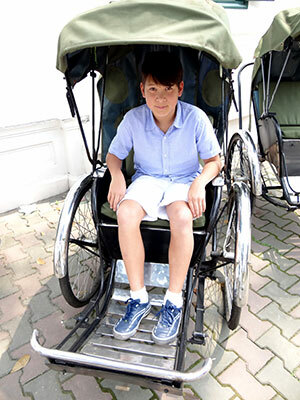 My dad and I took a "cyclo" ride which is a three-wheel cab that is pedaled. This was really exciting! You sit in the front and watch everything and the traffic go by. We walked around the old lake and then met up everyone for lunch which was in an old French mansion with lots of restaurant people cooking in the courtyard. The food was great! I met everyone on the trip and they were excited to be in Vietnam. 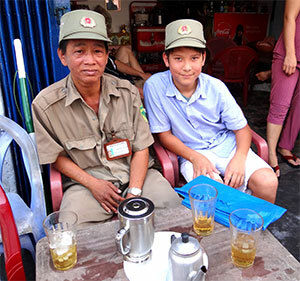 My dad had a friend named Hien in Hanoi and she picked me up to go play soccer with her son, Binh. We drove to a turf field and kicked the ball around and it was amazing to see all the new buildings in the part of town we went to. Later on Hien took me to meet her artist friend who makes lacquer art and is very famous for her paintings. Lacquer is art where you layer paint on a board, then sand it down to show the paint layers in a way to make a picture. It is really unusual and I learned how to do it with a small picture of myself. At night we met the group and had a great dinner at a French restaurant where Neal knew the French chef who is famous in Vietnam. The food he made was really good and I liked a special soup he made from pumpkins. 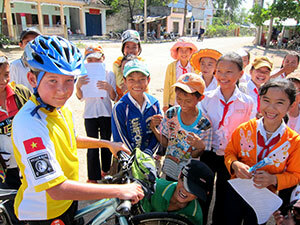 In Hue, we did our first biking! At first some of us were scared but I got on my bike and started riding and it was easy so they felt better and joined as we rode through the town to the countryside. On the way we stopped at a pre-school. The little kids were practicing dancing for a festival and everyone loved watching this because they were very cute. We rode our bikes to the royal tombs where the Vietnamese kings were buried and after, road along the river back to the city. There were rice fields all over and were as far as you could see. After we came back to Hue, we went to Thien Mu Pagoda. 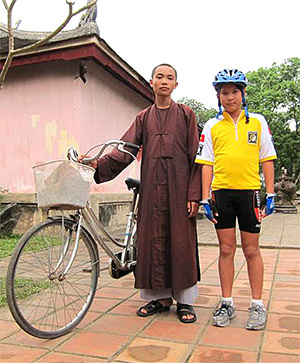 I met a boy monk who was the same age as me, also on a bicycle! After that we went to the giant castle called the citadel. By surprise, there was a very big elephant here and Borg rode it around! When were biking around the castle we came across a bunch of American tanks from the war. They were huge! You can climb on them and it was interesting to see them because you do not see things from the war anywhere else. We were tired then and came back to the hotel. Borg said he was going to get a spa and I went with him and thought it was free, but later on my dad found out when he got the hotel bill. Before dinner we went to visit a famous lacquer artist names Truong Be. He was having a reception at his gallery and there were a lot of people there to see his paintings. At night we had a cooking class at a mans home who was a relative of the Vietnamese kings and he told us about the history of his family. His wife showed us how to cook and we made some incredible food! We spent the morning riding along the coast where there are hundreds of burial tombs painted in bright colors. It was interesting to see them in the pure white sand. After lunch, there was a long climb - about six miles, but many people rode to the top. Natalie was super fast and left my dad and Neal behind! Andy and John were making jokes about the choco-pies when they stopped for water and it was really funny. Later we came to Hoi An which is a really cool place and my favorite in Vietnam. There a lot of old houses on the river and the market was really busy with people selling everything you can imagine. At night we had fun lighting little paper boats on fire and drifting them into the water. The next morning we had a cooking class with friend of Neal's and my dads, Miss Vy. Her class was hard but by the end, we had all cooked some really great dishes! I really liked our hotel here called the Nam Hai, it had the biggest pool I had ever seen and our bungalow was right on the beach. The beach was empty but I went in and water was really warm and the sand soft and white. The next day we took a long cooking class from a really famous chef named Miss Ly. She took us to the market and we saw seom incredible things all in one place like the head of a pig and fish in buckets. We learned about the things you use to cook Vietnamese food and then Miss Ly had us cook ourselves. We made all my favorites even spring rolls. We rode through the countryside all day today and it was the rice harvest time so there were people out everywhere. They were bringing the rice out of the fields and taking the rice off the top. I also stopped at two schools and met kids at the school. At one school, the day had finished and the kids went biking with me along the road. At the end of the day we came to a really amazing resort! I jumped into the pool and ran to the beach - it was empty! This morning we went to the fish market when the boats were coming in with the fish they caught at night. There were sharks! And also some other very large fish like tuna. Neal said one of the tuna would be really expensive in Japan and cost more than a car! The beach was really busy here so we went to the pool and the hotel had nice places to read. For dinner we went to place where you grill food at your table. It was really good. The restaurant turned out the lights and we thought the power had gone off, but it was a trick - they sang happy birthday and brought a cake out for my dad! Today we went into the mountains and drove up a long pass road. Everyone was happy we got out at the top before riding! We rode through the pine forests and came past some hilltribe towns. The people here are not Vietnamese but different people sometimes called hilltribes and Viet told me they are very poor. I could see they looked different and were a lot more shy than Vietnamese kids. When I gave them pens, sometimes they ran away! On the way to Dalat there were soldiers practicing drills and we stopped to watch them. Nansi and I were taking photos but then a commander came over and told us we canot to take photos but it is not like you may think, he was smiling and friendly too. We drove the rest of the way into Dalat while some were still riding. Our hotel was from the French colonial time and was restored with everything from that time period, including doorknobs and an old style tub. This city was really nice and we walked to the market where my dad bought me two Zippo lighters. These were the kind soldiers used to use during the war. One of my broke but Dung fixed in only a few seconds! That night we had a candlelight dinner at the hotel and after dinner Dia played the piano for everyone then we went for karaoke. Everyone in Vietnam loves to sing karaoke and after we each sang some songs but we were really surprised when Viet started to sing - he sounded like a professional singer and everyone was amazed! I took a video and will post that too. This is an amazing city. There are millions of scooters everywhere, zipping all over the roads like I have never seen before anywhere else in Vietnam or the world. It is the busiest place we have been and looks so modern with lots of skyscrapers, shops and I also saw my first fast food chain restaurants. It is like another country. It was also my favorite place for food! I had an incredible breakfast of eggs sizzled on a grill with fresh French style bread and butter and while we were eating I saw a guard with a really neat hat. We met him to take a photo and he was so nice he went to buy me another hat just like he was wearing (see the photo). It was my best souviner from Vietnam!